Playground games are enjoyed the world over and are passed on from one generation to another. Slight variations occur or they have different names, but essentially people play the same games. These workshops shared those experiences and continued the process of passing on games. Bringing the games together as a quilt continued the idea of sharing and passing on skills and experience. Some of the older participants were nervous of drawing or painting on fabric but with a little help and encouragement, they soon got into the spirit. In the same way, the older participants helped the children with their sewing. Each participant created at least one panel and their creativity, imagination and enthusiasm is reflected in the diversity of the colourful panels. The bonds made during the creation of the panels continued as we sat round the table sewing the quilt together and telling stories – a truly intergenerational and sharing experience. We skipped, we sang rhymes, we played marbles and jacks (or ‘five stones’), we took photos, we painted, we glued, we sewed … and we had a lot of fun! I worked with photographer Yara Tschallener devising and leading the workshops and completed the sewing up of the quilt - a new experience for me! 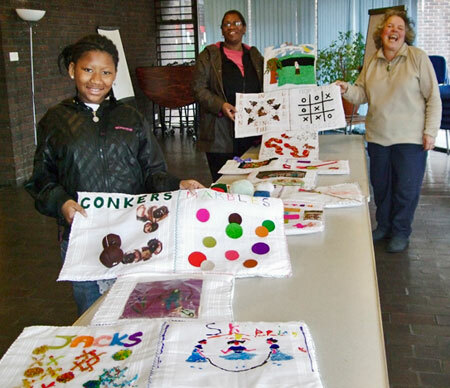 The quilt was displayed in Lambeth libraries during 2008. Sunshine & Memories was a year-long intergenerational project with Lambeth residents. It brought together people of different ages and cultures to celebrate their holiday experiences. The stories ranged from lifelong dreams come true to nightmare journeys never to be repeated. It looked at the commonality and differences across the generations in the changing world of holiday time. We have shorter working hours now and travel is easier but for hard-working parents, holidays still represent an opportunity for families to spend precious time together. Today we photograph the world around us all the time with digital cameras or even our phones, but the treasured old black and white photos of yesteryear bring back happy memories of people and places. My role in this project was to devise and lead a range of workshops and to design the final exhibitions. The participants shared photos and memories, took part in workshops in creative writing and learned both film and digital photography skills. 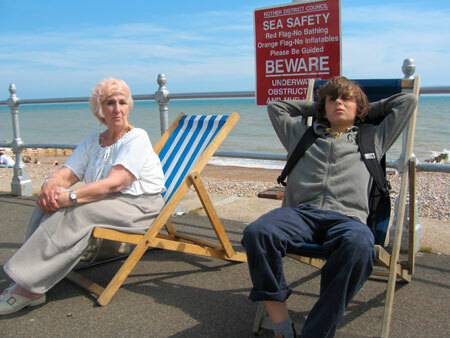 We also had a lot of fun and an unforgettable day trip to Bexhill on Sea. During Celebrating Age Festival 2006, the work was exhibited at the Redgate Gallery, Oval House Theatre, the Ritzy Cinema, the Phoenix cafe and Lambeth libraries. Supported by Lambeth Libraries, Archives & Arts, Awards for All, Arts Council, Space for Sports & Arts and Age Concern Lambeth.